For 1973, the LeBaron was in it’s last year of a generation, which was built in Chrysler’s ‘fuselage’ look since ’69. Its wheelbase was a lengthy 127 inches. The platform was an offshoot of the C-body, being called a Y-body for the LeBaron. Two body choices were made available which were a 2-door hardtop and a 4-door hardtop. The unique bumper on the ’73s framed the grill like on the 1972s. Powering the 1973 LeBaron was one engine, a 215hp 440 CID 4bbl V8. LeBaron had many unusual options for the time. A dual left/right control head for the air conditioner was offered for $250.85 while there was even an option for a rear seat area heater/defroster for $78.10 . An automatic high-beam dimmer was offered for $50.60 . There were a few performance options as well. For just $18.00 you could get a Sure Grip differential to keep the 440’s torque in check. Also for $18.00 you could get a heavy duty suspension group. The most interesting option, for $344.00, was the Four Wheel Sure Brake system. It was a primitive form of anti-lock brakes that had its own computer and four wheel speed sensors. 1973 was also the final year for this system. 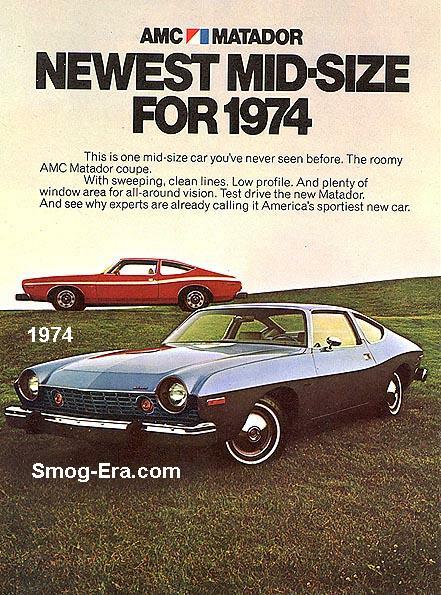 On a side note, this car was the longest production automobile sold in America for that year, mainly sue to the extra ruber strips on the bumpers. Headlamps were hide-away types hidden behind grill-like doors. 1974 brought a new look to the LeBaron, as was the case with all big Chryslers that year. Wheelbase shrunk down to 124 inches. The brakes became a 4-wheel disc type system. Still sporting hideaway lights, but this time behind doors that looked like, well, doors. Body styles offered were still a hardtop sedan and a hardtop coupe. Pricing approached $8000 this year. The V8 was a 440 4bbl again, with output up to 230hp. Options offered were just as varied as the previous year. Buyers were given the choice of power sunroof, heavy duty suspension, heavy duty shock absorbers, power trunk release, and Sure-Grip differential, just to name a few. 1975 was the end of an era for a little while, being the last year for the LeBaron nameplate, wearing the Imperial crest that is. Power dropped back down to 215 this year. For its last model year, the LeBaron received a few upgrades. One was the wiper arm-mounted windshield washer jets. An automatic height control suspension was standard this year too.